On Wednesday I will be a chaperon on my son's field trip to this cute little orchard. I'm really looking forward to spending the day with him and his class. I love this time of year...pumpkins, carmel apples, hot cider, jumping in leaf piles...ahh, lovely fall. 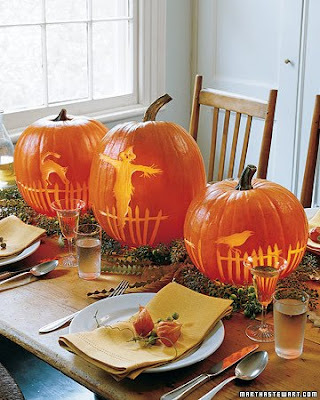 I can't wait to carve and decorate pumpkins with the kids this year. I think this will be the year that both will be very excited to do so. I love starting little family traditions with them. I've seen so many lovely ideas in what to do with pumpkins in many magazines and online but, I still have a huge place in my heart for a good old fashioned carved one. Better Homes and Garden has some great stencils to download. Thought I'd share in the fun!